In these days when we're all listening on the news to the developments in Syria and Iraq, the emergence of the Islamic State, the conflict between Sunni and Shia, the plight of fleeing Yazidis and of the Syrian Christians, I was struck by this powerful essay by Robin Yassin-Kassab, exploring the historic links between Syria and Galloway. Yes, of course there were Syrians (and also Nubians - people from what is now Libya and Morocco) on the wall. I've mentioned them before on this blog. And we know that at the end of their service, they were not sent home: instead, they were given grants of land locally to where they were stationed at the end of their service. So there were certainly Syrians and Nubians settled on what is now Northumberland and Cumbria, and their descendants are almost certainly still there. Closer to home, the Romans established a harbour in Orchardton Bay, and a road - most of which is still used today - from there, through what is now Gelston and Threave, to their fort at Glenlochar. The fort at Glenlochar was not garrisoned for very long - from 81 AD, but probably for only about twenty years - and as far as I know we don't know which legions garrisoned it. So I don't know whether there were Syrian archers at Glenlochar, but it's by no means impossible. 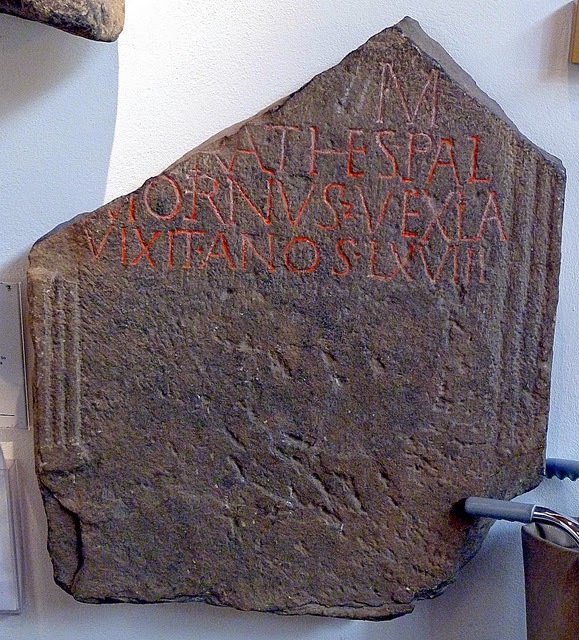 Furthermore, if the flag-maker and merchant Barathes mentioned in Robin's essay was trading from Corstopitum, he was probably trading across the wall; in which case it's quite likely that he visited the Kelton Hill Fair, which was an important trading fair from the Bronze Age until the enclosures of the eighteenth century. So Barathes very likely knew the landscapes we're familiar with - with Screel, with Bengairn, with the road up past Taliesin. But the very name 'Cumbria' - land of the Comry, the people, in modern terms the Welsh - reflects what happened after the legions were recalled in AD 383. The Brythonic kingdom of Rheged, whose caput was at Dunragit in Wigtownshire (shown on Ptolemy's map as Rerigonium), expanded south to include lands at least as far south as Penrith. So at that point, the settled legionaries became citizens of the same state that contained what is now Castle Douglas. Rheged was heavily defeated at the Battle of Catraeth (what is now Catterick, in Yorkshire. where the Syrian Goddesses you mention were found) in about AD 600 - at more or less the same time as Muhammad started to pray in his cave on Mount Hira - and Northumbrian Angles spread into what is now Galloway, establishing their own villages of Kelton and Gelston close to the long-established Brythonic village of Threave. Through that turbulent period, isn't it likely that some of the descendents of people from south of wall moved north of it, either with the retreating people of Rheged or with the advancing Northumbrians? Populations have been mixing - and people have been trading - since the first mesolithic settlers arrived here. Galloway was on the trading route which was already well established when Pytheas of Massalia - what is now Marseilles in France, but then a Greek colony - followed it around 325 BCE. The quest for a single, authentic ethnicity for the people either of Galloway or of Scotland has always been a false one. There are Gallovidians of Scots ancestry; yes. But it's also worth remembering that there are Gallovidians of Brythonic, and, let's remember it, also almost certainly Iberian and Syrian and Libyan ancestry, who were here before the Scots; and Anglians who were here at the same time. Ethnicity does not define who we are. What we do, and how we relate to the world, defines who we are.